I was thinking what is the best solution to add a reverse current blocking on switching regulator. My first thought was to look for an ideal diode circuit but all of them were too much expensive. The cheapest solution was to put a simple diode but they've got significant amount of voltage drop. I thought to hide the diode's voltage drop inside the switching regulator. Connecting the feedback pin of regulator at the diode's cathode the Vo would be maintained to just at the desired set point. 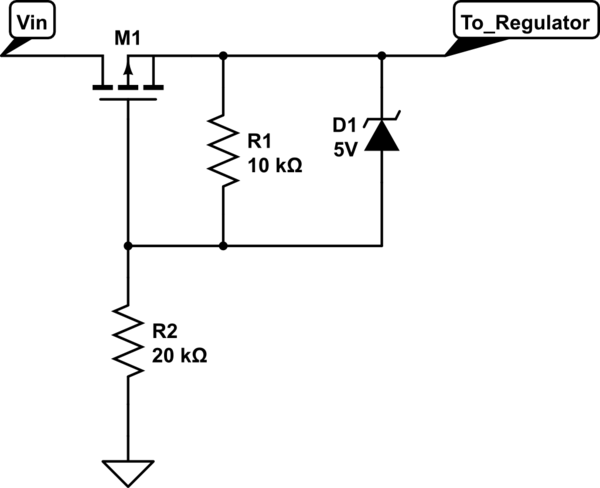 What are the pros and cons of this circuit? Whoops, my mistake. 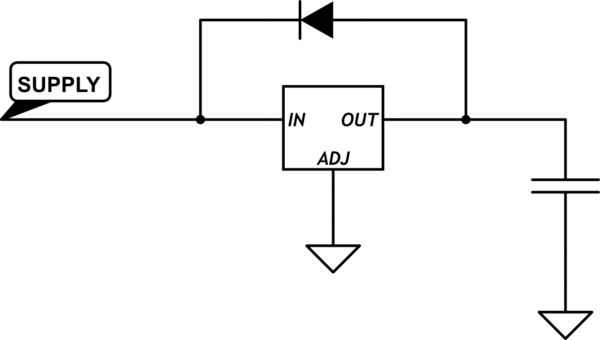 Should be a P-FET, not an N-FET, otherwise the concept is the same. You still need to be able to set the resistor divider ratio properly based on your Vin, Vout, and the FET threshold voltage. The 10k and 20k I show is just an educated guess for something like a 12V input at Vin and assuming the FET has a threshold voltage range of approximately 1.7V-4V. Also, the zener may not be totally necessary, it's just there to stop the FET from having too much gate-to-source voltage if Vin is too large. It would still be better to use a DC-DC converter with built in reverse current output short-circuit protection though. Not the answer you're looking for? Browse other questions tagged diodes protection reverse ideal or ask your own question. Why are diodes heating up and smoking? Which way to hook up boostrap diode for switching regulator?